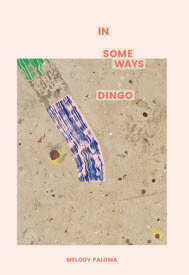 The cover of Melody Paloma’s first poetry collection, In Some Ways Dingo, is a work by the artist Emma Finneran called ‘Into Stella.’ It’s formed from acrylic, ink and pastel on cotton drop cloth. Finneran’s work is interested in the material possibilities of drop-cloths: cloths typically instrumentalised into catching ‘the excess paint from Mum’s feature wall’ (in Finneran’s words) and to be eventually ‘rendered forgotten, formless, shapeless, degraded – to be dropped.’ Finneran’s practice reanimates and repurposes drop sheets into paintings, embellishing aleatory markings. The green and purple brush stripe near the centre of the cover art of Paloma’s book, for instance, elaborates on accidental strokes to create a marking that gestures towards a street strip, evoking the way In Some Ways Dingo drives its reader across the page. This is a poetry collection that Sian Vate suggests doubles as a ‘road movie’ (Melbourne launch speech, 2017). In any case, this cover displays discarded detritus as productive of making, meaning and abstraction. Finneran’s practice is both procedural and unruly freeform. Thick with the textures and the robust practicalities of art making, Finneran’s work mirrors as much as it frames In Some Ways Dingo. Paloma’s use of poetic catalogue as a kind of documentation of detritus could be read through the non-fiction poetry framework of the Rabbit Poetry Journal’s Poets Series (this book is number 9). At the same time, though the poems incorporate lists within themselves, the poems are not themselves lists, or rather, in their reading, they rapidly move back and forth from being lists to being less list-like, suggesting by doing so the way narrative, description, lyric, road movie can be boiled down to an itemised catalogue for a ‘knick-knackatorium’ (‘A letter in three parts or more’). Returning to Finneran’s drop-sheet: it is also a useful reference point for In Some Ways Dingo because of the way these poems persistently return to what falls downwards, what is buried, and what it might mean to fall into the ground, ‘swallowed by pavement’ (‘Sinkhole Poem’), ‘Edge sinks back into the / Ground’ (‘Periphery’). This book is animated by the injunction to: ‘remember all things come from the ground’ (‘Olympic Australis’). which may include important fossil or sub-surface features. Specialised habitat for plants and animals. A geological resource that may have mining potential. 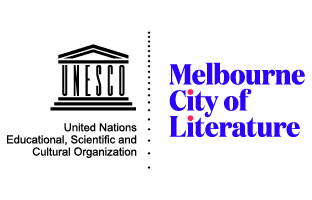 These lines, along with the title of the poem ‘Special Values and Characteristics,’ are taken entire from the Lake Gairdner National Park Management Plan from the Adelaide Department for Environmental Language and Heritage (2004). The only alteration is the excision of bullet points. Repurposing the language of the state, forcing us to read a government document as poetry, Paloma’s poem displays, with the arresting force of an open -cut mine, the way culture, environment, country becomes reduced into points of profit potential. The poem does not end with the words of the state: rather, set apart from the rest of the poem in italics, the repurposed material potentially functions as a page-long epigraph to a poem that registers a space ‘where the ground closes in’. Paloma’s powerful use of ‘Remaindered, devalued goods’ as fodder for ecological and political poetry could be situated within the avant-garde aesthetic category of the ‘stale’. In a review in Cordite Poetry Review of Emily Stewart’s recent book, Knocks. 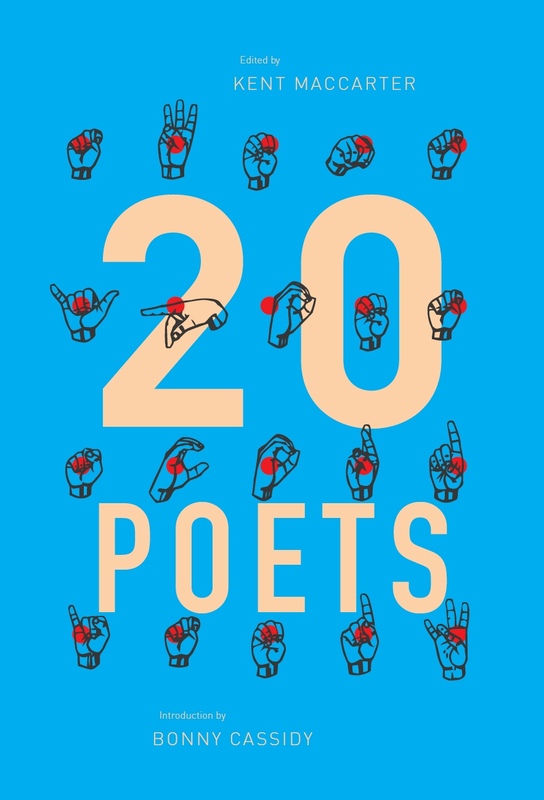 Paloma describes Stewart as part of a ‘new wave of avant-garde poetry in Australia’ but that Stewart’s poetic processes simultaneously resist being boxed into a singular movement or community. Just like Stewart’s work, Paloma’s work can also be cited as part of a ‘new wave’ of Australian poetry and resists easy categorisation. I’m also thinking here of Paloma’s gripping experimental performance at her Sydney launch of the long closing poem of the collection ‘Gimme Gimme Gimme,’ where she squatted, jumped, crunched and ran her way through the poem. I think here also of her durational performance piece hosted by SOd, ‘Some Days’ taking place over the course of this year, a long poem which is written or edited every day of 2018. At the time of this review’s writing it is divided into monthly segments, each radically different from the last. But this of course is entirely subject to change. In Some Ways Dingo embraces lexical shifts on the level of the line, through the poem, across the page, between poems. Language tugs in multiple directions, across different spaces/places, moving beyond, through, away and deep beneath. This entry was posted in BOOK REVIEWS and tagged Amelia Dale, Melody Paloma. Bookmark the permalink.